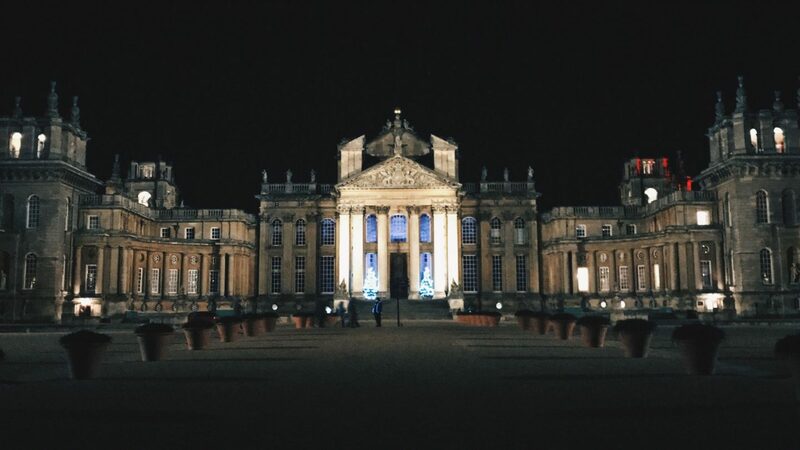 Christmas At Blenheim – How We Got Into The Festive Spirit.. Absolutely anyone that knows me, will know that I am basically in the festive spirit all year round. Christmas makes me all warm inside – the happiness that it brings, all the smiley faces, and we cannot forget the ridiculous amount of food the comes alongside it. My boyfriend, however, is The Grinch! When I got invited to Christmas at Blenheim, I instantly thought of inviting him as my guest, before remembering that he hates absolutely anything that involves being festive – I obviously dragged him along regardless, in the hope of making a festive lover of him yet..
We arrived for the opening evening just after sunset, donning our coats and scarves, all ready to venture round! We were fortunate enough to be invited to the opening drinks that night, and we arrived just before they were due to begin, quickly making our way through the entrance, past the fairground rides and food stalls, and into The Grand Hall. Munching our way through the nibbles of pigs in blankets and mince pies, and drinking hot chocolate and mulled cider, we heard of the extent of planning that goes into the event – six months of preparations, and apparent sleepless nights, for an event that last year, saw one hundred thousand people attend! Having heard such amazing things about the trail, our hopes were set very high, to say the least..
We made our way back out of The Grand Hall, and headed down towards the entrance of the trail. I was worried that the trail would be crowded, having seen the numbers arriving at the beginning of the night and having watched the people leave the opening drinks almost all at once, but I was pleasantly surprised. We made our way through the trail at our own pace, often stopping for pictures and just a general ‘better look’ – James really enjoyed the ‘Bridge of Fire’ as we called it, while I spent a little too long watching an animation projected on one of the garden walls, and an interactive element that involved walking through hanging lights, called ‘Squid Soup’! Throughout the trail, marshalls were placed regularly to ensure that we were following the correct route, and to answer any questions or queries that we may have had. Christmas at Blenheim is “presented in the natural landscape” as the website states, but I did spot various re-routes across harsh terrain or hills that were suitable for buggies and wheelchair users, as well as lifts and ramps down stairs, making it accessible for most, which I loved! We were fortunate enough to visit when there hadn’t been much rainfall, so the trail was predominantly dry and manageable in trainers, but I can imagine the need for boots or wellies if the weather was to take a turn for the worst.. I would, one hundred percent, recommend taking cash with you, because as amazing as the mulled wine and various food stalls smelled, they all only accepted cash, which we were silly enough to not bring! There is also an opportunity to roast marshmallows halfway around the trail, as well as other food and drinks vans dotted throughout, which we, unfortunately, missed too as a result..
We both had an absolutely fabulous evening, and would highly recommend a visit – The Grinch even had a smile on his face by the end of the night, so I would definitely call it successful! We were very kindly invited along by Melodie from the team at Christmas at Blenheim, but tickets are available for around £16.50 for an adult and even less for a family, which we think is really well priced. We spent around an hour and a half walking around the trail, without stops for food and drink, which would have definitely made the evening a little longer – I’m genuinely so sad that we didn’t get to roast any marshmallows or try any of the gorgeous smelling food! The event itself is on until the 1st of January, and is one that should definitely not be missed..
What events are you headed to across the festive period? Will you be making a trip to Christmas at Blenheim? How To Survive A Holiday Together..
"It’s The Most Wonderful Time Of The Year – Winter To-Do List.."
"My November Favourites – What I Loved Throughout The Month.."